BCV principals Hans Baldauf and Chris von Eckartsberg are providing dispatches from the road this week as they travel to Milan for Expo 2015. Riding back to our apartment this evening after spending a full day at the Expo, Chris and I found ourselves talking about the urban design plan and landscape – or lack of landscape – more than the design of the pavilions (and there is some amazing design). 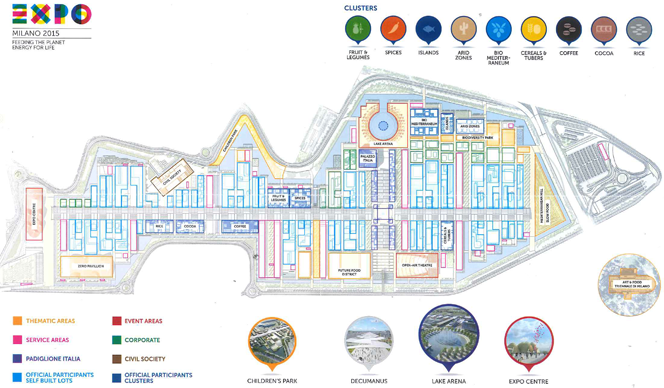 The Milan Expo has a strong plan that consists of a main boulevard (the Decumano) and a principal cross street (the Cardo). The Decumano is covered by a large tensile shade structure that is unfortunately both vast and uninspired. It is only broken at the Cardo. This tensile structure provides an impoverished open space that is paved in painted asphalt. There are fingers of landscape between some of the multi-tenant pavilions along the Cardo, but none of them creates a strong landscape statement. In the end, this is the strongest lesson of the Fair for us – the need to create a strong urban plan within which the individual pavilions and groups of pavilions can express themselves. Landscape should play a central role in such a plan; it is sadly missing here. 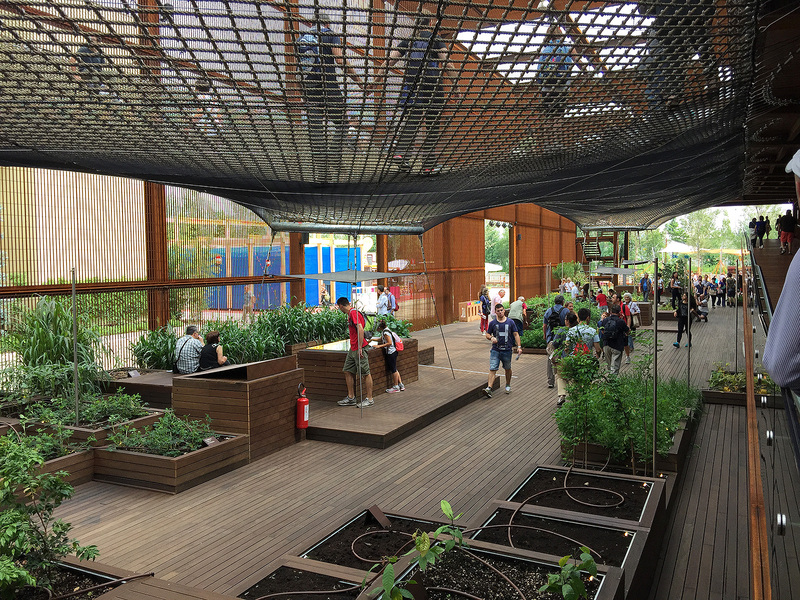 The thematic groups of pavilions – Rice, Cocoa and Chocolate, Fruits and Legumes, Spices, and Cereals and Tubers – provide some of the most interesting parts of the urban design. Here, the scale is broken down and the repetition of the small pavilions in each zone allows for a stronger sense of spatial enclosure. The three exquisitely detailed Slow Food pavilions at the eastern end of the Fair bring the scale down even further. The theme of the Slow Food pavilions is “preserving biodiversity.” Here one really senses the transition to the farm, particularly with the view of the adjacent Mediterranean hillside covered in olives. 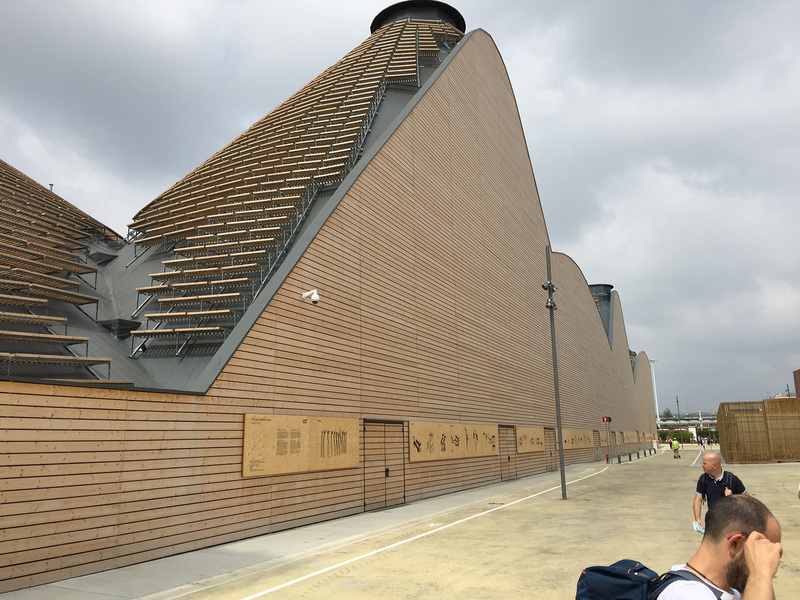 The Herzog pavilions are an essay in the careful detailing of wood construction in which the subtle sloping of block between the tapered wood beams mirrors the slope of the roof structure, creating a rich spatial play in a seemingly simple structure. Here also hand rails become stand-up bars and the simple raised beds of the central garden create a set of views that counterpoint the nearby hillside. Pavilion Zero at the west entry is in many respects the theme pavilion for the Fair. One wishes that it occupied the western end of the Decumano, which – though of the same architectural vocabulary – is sadly given over to the media center. Pavilion Zero is made up of a series of seven sloping roof forms bound together in a rectangle. The domes open onto a central courtyard with a huge set of wooden tables representing Pangea, when all continents were a single mass. 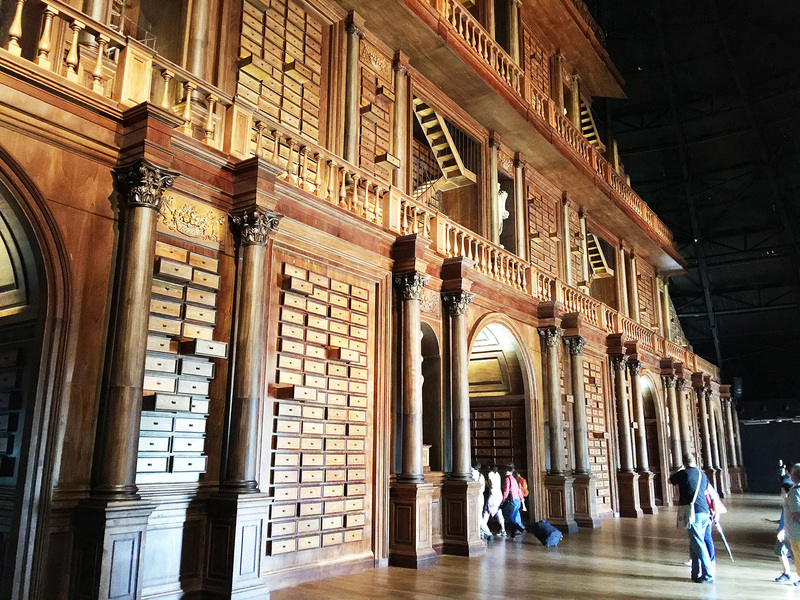 The pavilion’s exhibits begin with a huge wooden classical façade that evokes the great wooden Farnese Theater in Parma – but here the wooden façade is also a massive chest of drawers in which one expects a library of seeds to be stored. The exhibits tell the story of the evolution of human agriculture and the challenges that now confront us. Part of the 18 United Nations installations at the Fair, this pavilion closes with the challenge to help reduce food waste as a means of getting to the goal of zero hunger in the world. It is a powerful introduction to the Fair for those who, like us, entered at the western gate, and as the Slow Food pavilion is for those who enter from the east. The third gate to the Fair is the south entrance, which opens onto the Cardo. We will report on this in detail tomorrow. 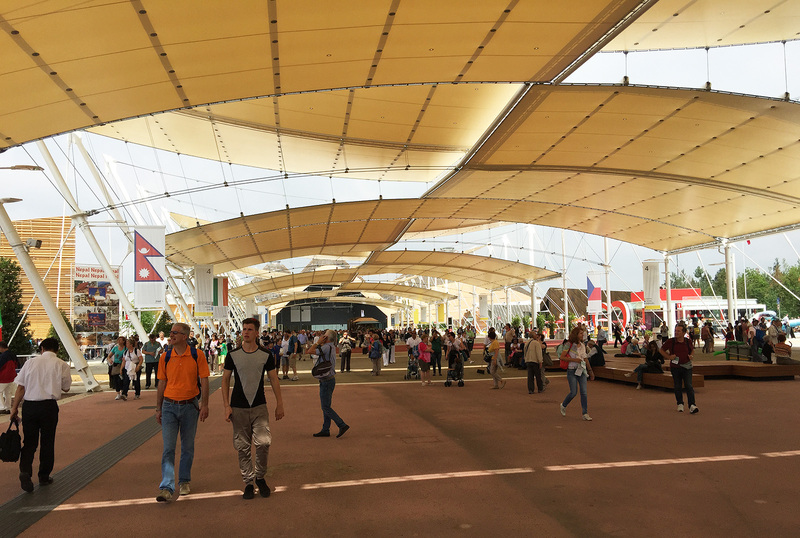 The various national and corporate pavilions make up the majority of the Fair’s buildings. In this, the Expo is very different from international expositions of old, dating back to the Crystal Palace in London, the Chicago World’s Fair of 1893 and the 1915 Panama Pacific Exposition, in which large thematic palaces provided a counterpoint to the national and local pavilions. In Milan there are a series of multi-tenant buildings but they are clearly background buildings – not strong buildings which would help define space. As a result one is left to admire the architecture of the pavilions. Fortunately there are some magical ones. We will limit our comments to those we have seen and liked. There are so many that in our short stay we are sure there are ones which will deserve mention that we will miss. We loved the Brazil pavilion, designed by Studio Arthur Casas and Atelier Marko Brajovic, for its simplicity, richness, and fun. We love the poetry of walking up the net over the ground floor garden. 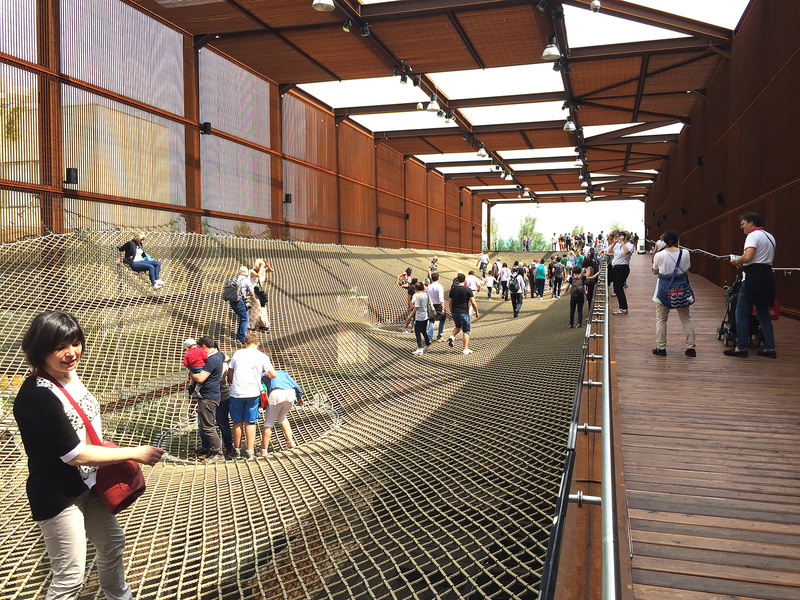 Visitors explore walking on the netting at the Brazil pavilion. Speakers subtly play recordings of Brazilian birds overlaid with the faint strains of music. One is transported to the rainforest without knowing it and it is as if you are walking through the forest canopy. The 1st floor (2nd American floor) has a large gallery filled with a hanging sculpture composed of ceramic bird houses. A restaurant (where we ate lunch) and theater occupy the balance of the floor – wall projections in the gallery tell the story of Brazilian agriculture, as do second-floor glass panels. But what we appreciated most about the pavilion was how the agricultural themes, from the garden below the net to the interior presentations, were all part of a composition that allowed the ethos of the place to come alive. The nearby Bahrain pavilion, by Studio Anne Holtrop, with its amazing weaving of covered and exterior spaces, transports one in an abstract way to this desert kingdom. This pavilion is simultaneously very rich and abstract. 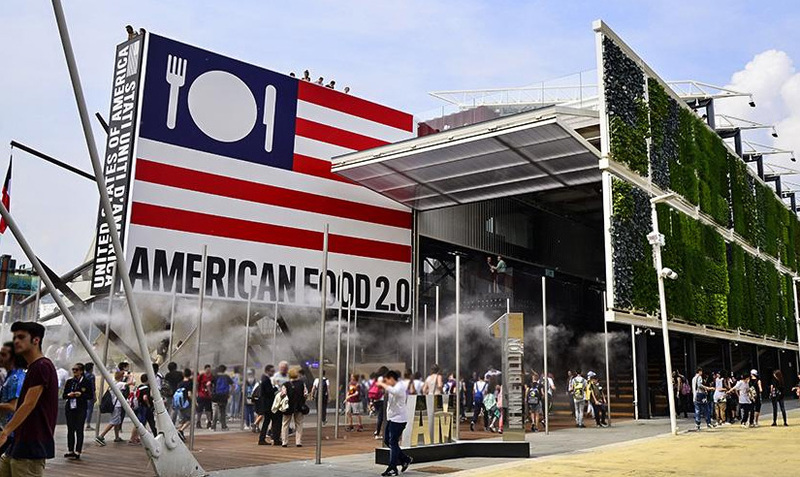 The American pavilion is both strong and sophisticated. Chris remarked that it has the authority of a battleship. Here the flank of the steel ship is made up of a motorized living wall made up of edible plants. The dramatic ramp stair leads up to the main floor, which is open front and back. Unfortunately the exhibits compete with the architecture here and add little. The café and outdoor theater on the upper level provide dramatic views – which security denied with Michelle Obama’s visit. 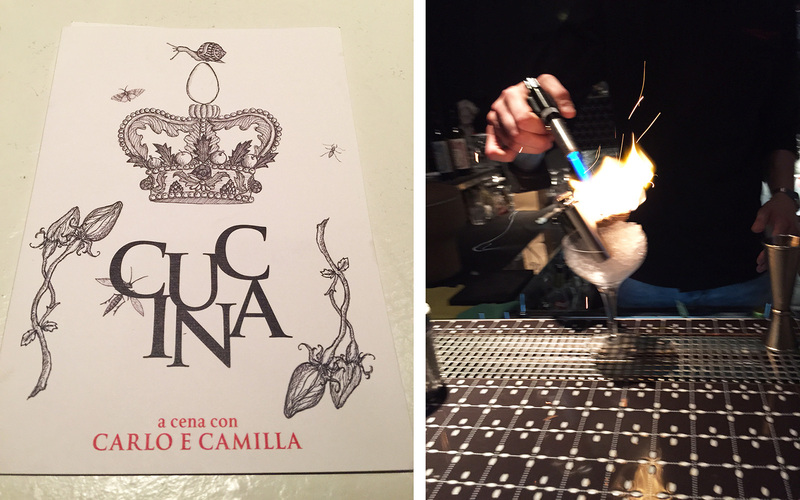 The day ended with a visit to Carlo e Camilla, a restaurant set in a former saw mill from 1920. The original building had been bombed out in World War II and rebuilt after. In 1999, owner Tanja Solci continued a restoration of the building with her father, leaving the existing character largely untouched and adding flourishes like the ornate chandeliers that hang dramatically over the tables. 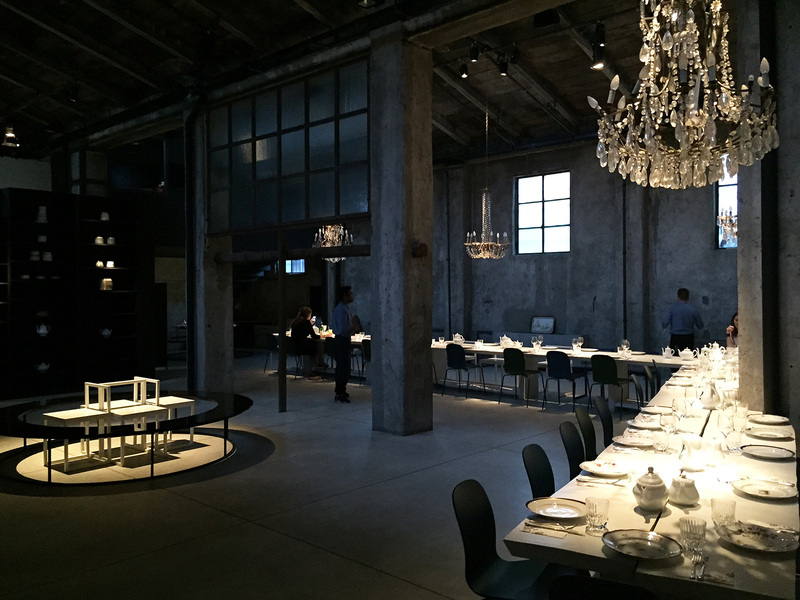 Diners sit along communal tables formed like a cross and are treated to an imaginative and detailed menu by the talented chef Carlo Cracco.